All the Goodwin College news that's fit to print. Military Advanced Education (MAE) has awarded Goodwin College the designation of a Top School in its 2015 MAE Guide to Colleges & Universities, measuring best practices in military and veteran education. The Guide was released in the December issue of MAE. The Guide presents results of a questionnaire of the military-supportive policies enacted at more than 600 institutions including private, public, for-profit, not-for-profit, four-year, and two-year colleges. From community colleges to state universities, online universities and nationally known centers of higher learning, MAE’s 2015 Guide to Colleges & Universities arms students with information about institutions that go out of their way to give back to our men and women in uniform. About the new designation, Assistant Vice President and Dean of Students at Goodwin College Sandy Wirth said, “We’re delighted and honored by this recognition. One of the basic tenets of our philosophy is to remove as many barriers as possible to getting a college education for our students, including present military personnel and veterans. They enrich our College community through their life experiences and we, in turn, help them transition to the next chapter in their lives.” Click here to find out more about Goodwin’s services for military personnel. Costello lauded the hard work that the graduates had put in, and then turned the applause on the assembled audience. She urged members of the audience to stand and recognized those who had supported the graduates throughout their education: the mothers, fathers, grandparents, significant others, and children who had been there to support the graduates every step of the way. As the nursing graduates received their pins, Associate Professor of Nursing Pam Walker read individual affirmations that the graduates had written. 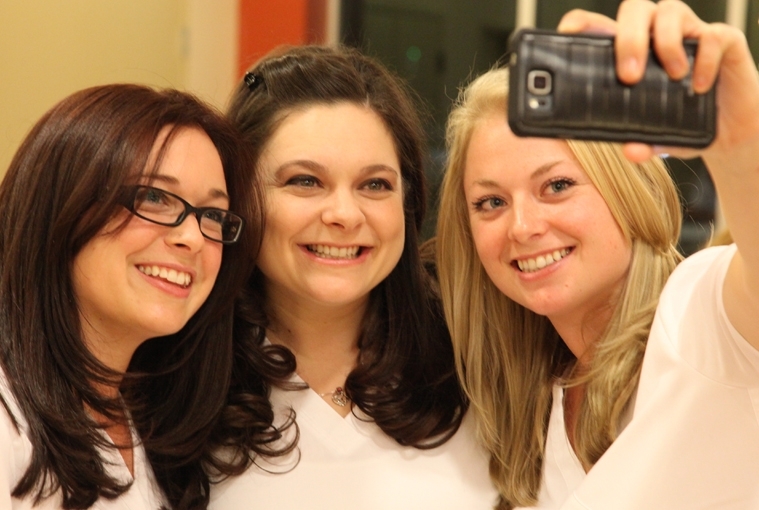 The pinning ceremony dates back to the 1860s when Florence Nightingale was awarded the Red Cross of St. George and in turn presented a pin to nursing graduates. By 1916, the practice of pinning new nurses was standard throughout the United States. As part of the ceremony, the flame from the ceremonial taper candle became a symbol of the care and devotion nurses administer to the sick and injured. Today, the chair of the nursing department lights the first candle, and the flame is then passed on from nurse to nurse. Click here to see photos from the ceremony. “Wednesday December 10, Goodwin College’s MOVE and WISE program hosted a cookie decorating workshop for members of Boys & Girls Clubs of Hartford. Students from Connecticut River Academy and their mentors from Goodwin College provided sugar cookies for Boys & Girls Clubs of Hartford’s members to garnish with festive and tasty sprinkles, candies and icings-and to eat!” Read more at http://www.courant.com/community/hc-ugc-article-goodwin-college-and-connecticut-river-academy-2014-12-15-story.html. Goodwin’s MOVE and WISE students are participating in an on-going mentoring program with students at the Connecticut River Academy (CTRA). Mentors meet with their high school mentees twice a month for a one-on-one and for a group community service sessions. This month’s group activity was volunteering at the Asylum Hill Boys and Girls Club. The Goodwin and CTRA students spread holiday cheer by bonding with the children and decorating holiday cookies. Ashley Charles, a WISE mentor, enjoyed her involvement. “It was great seeing the kids so happy. 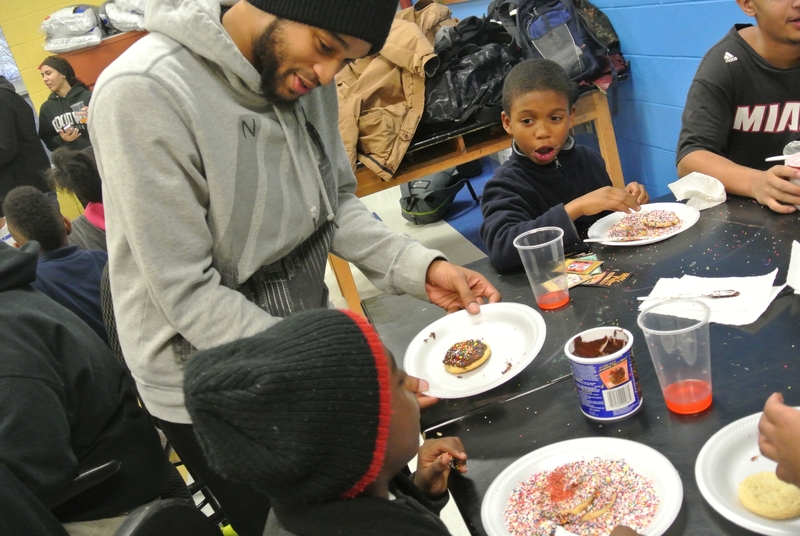 It was a fun bonding activity to spend time with not only my mentee, but with the children as well.” The children at the Boys and Girls Club were able get to know and learn from the students — and get a sugar rush at the same time! Goodwin and CTRA look forward to partnering with the Boys and Girls Club again. Over 80 members of the national magnet and public school choice community attended the conference on Dec. 4 at Goodwin College’s campus. Goodwin College’s Center for Magnet and School Choice Leadership held their second annual national symposium on December 4, hosting top leaders in the magnet school field to share their latest research with colleagues from New England, New York, Washington D.C., North Carolina, and around the country. The Center’s second annual Magnets in a School Choice Arena: Innovators of Change conference took place at the College’s main building and involved presentations from leading researchers and educational leaders in school policy, law, administration, curriculum, and instruction. These field experts shared findings on the future of public school magnet programs in light of court rulings, policy developments, and research findings. “Goodwin has an excellent magnet school program, and we’re excited to be able to provide a forum where educators and researchers can learn and share with colleagues from around the country,” Goodwin’s Magnet School Specialist Alex Henschel said. Addressing critical topics to educational progress, this year’s keynote speakers included Richard D. Kahlenberg, Senior Fellow, The Century Foundation, Washington, DC; Dr. Roslyn Arlin Mickelson, Professor of Sociology, Public Policy, Women and Gender Studies, University of North Carolina at Charlotte; and Dr. Jia Wang, Senior Researcher and Project Director, National Center for Research on Evaluation, Standards, and Student Testing at UCLA. 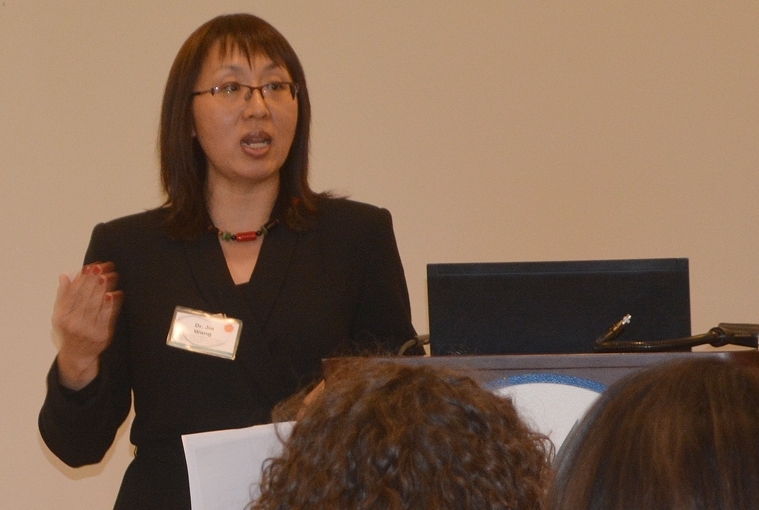 Wang shared her highly anticipated research findings for the first time at the Goodwin symposium. Morning and afternoon sessions included panels addressing evaluation of choice programs in Connecticut and increasing access to magnet schools for English Language Learners. Goodwin hopes that sharing the information at the symposium will help to further grow and perfect the region’s magnet school culture. “We are reaching out to our partners in the area — Hartford Public Schools, East Hartford, Bloomfield, CREC, the State Department of Education and other colleges and universities — in the hope of applying this research to Connecticut’s magnet schools moving forward,” Goodwin’s Dean of Magnet Schools, Alan Kramer, said. All presentations will be posted on the Goodwin College website. For more information, contact William Magnotta, Director, Center for Magnet and School Choice Leadership at 860-913-2109 or Dr. Robert Brooks, Conference Coordinator, at rbrooks@goodwin.edu. 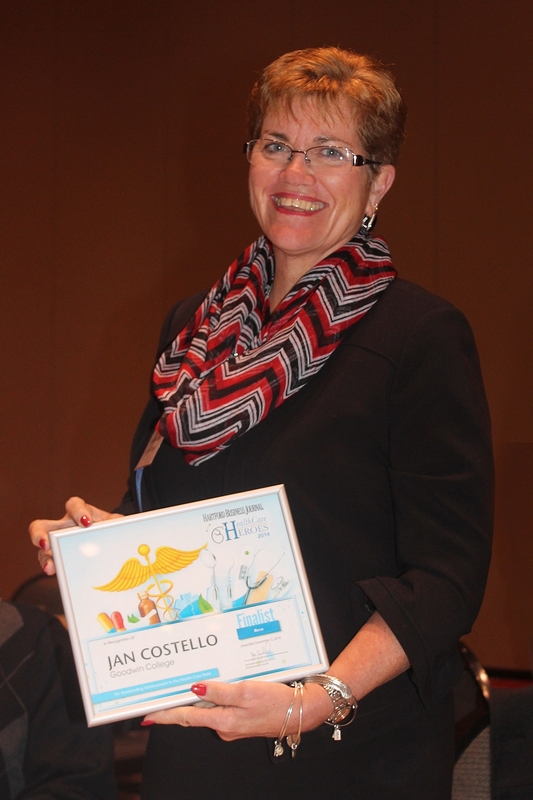 Goodwin College is proud to announce that Jan Costello MSN, RN was named a finalist in the Hartford Business Journal’s Health Care Heroes program and honored at a reception at the Connecticut Convention Center on December 2. This initiative recognizes individual who have contributed significantly to their respective areas in health care. In 2013, the Connecticut League for Nursing (CLN) recognized Jan with its President’s Award for nursing leaders who have contributed significantly to their profession through volunteerism, commitment, and active participation. She has developed clear competencies to enhance the learning experiences for her students at Goodwin and is a passionate advocate in the area of geriatric education. She is a visionary with a strong capacity for leadership and planning, evident through her work with the National League for Nursing’s Evaluation & Testing Division, as well as her work with CLN on a statewide basis holding the positions of president-elect for the Board of Directors, chairperson of the Eldercare Workgroup, and active member of the Council of Deans & Directors. Go to the HBJ’s Health Care Heroes edition. Goodwin College is now offering a hybrid Histology program, in which students take didactic lectures online and attend Saturday in-class labs. Students are able to spread their workload out into four semesters, making it more manageable. Students with a full-time job, family commitments, or various other obligations can still receive an education that will prepare them for a position in this lucrative health care field. This specific program is open to seven students per year. Justin Kovalcek, current hybrid student, enrolled in Histology because of his fascination with the health care field. Goodwin hopes to expand the hybrid program in years to come to account for students who lead a busy life, but still wish to receive an education in the health care field.